As a "car guy", one question that I've been asked often is what "one thing" got me into cars. For most people, they usually have stories of watching their fathers wrench on old cars on an given Saturday afternoon. That wasn't me. While my dad certainly enjoys cars, and has owned some pretty neat stuff over the years, it has never been a priority for him. He laid the framework, but it easily could have never blossomed into the borderline obsession that it became. My love for cars has always come from my similarly obsessed friends, and Justin was the first. I first met Justin at Northgate High School in Newnan, GA around 2001. We were part of the drum line, and spent most of our afternoons sitting in the back of the band room talking, joking, and occasionally, playing drums. Justin was already a pretty big car guy and would occasionally bring in issues of Sport Compact Car and Super Street to read during that time. While I was already aware of the early 2000s show scene thanks to The Fast and Furious, the simpler JDM builds in the magazines piqued my interest in a way that the other more extravagant builds hadn't before. Around the same time, Justin had also sold his Mercury Tracer to purchase a white 1993ish Civic hatch with a stripped interior and Acura "Fat Five" wheels. It was the first time I'd ever seen someone allow a Honda to stand on it's own, and after that, there was no looking back. I was hooked. Nearly 15 years later, and we're seemingly a lifetime away from those days in high school. Justin is moving from his home in Augusta to Maryland soon, and he sent me a message on Facebook asking if I'd be interested in photographing his modified 1965 Mustang. I jumped on the opportunity, we freed up a weekend, and took an evening in Macon to catch up and check out his latest project. Justin's goal for this car is a classic OEM Mustang with some modern nods to drivability, reliability, power, and aesthetics. When he purchased the car it had already had a mild restoration, having the original unit swapped out for a Foxbody-era 5.0 powertrain. The car had also been painted a dark blue with silver stripes, but needed a new look. The gloss black on silver BBS LM look-alike wheels is a surprising, but admittedly killer, look for the classic muscle car that pulls inspiration from Ford Racing Performance Parts 2003 SEMA build. The interior has been kept mostly stock. 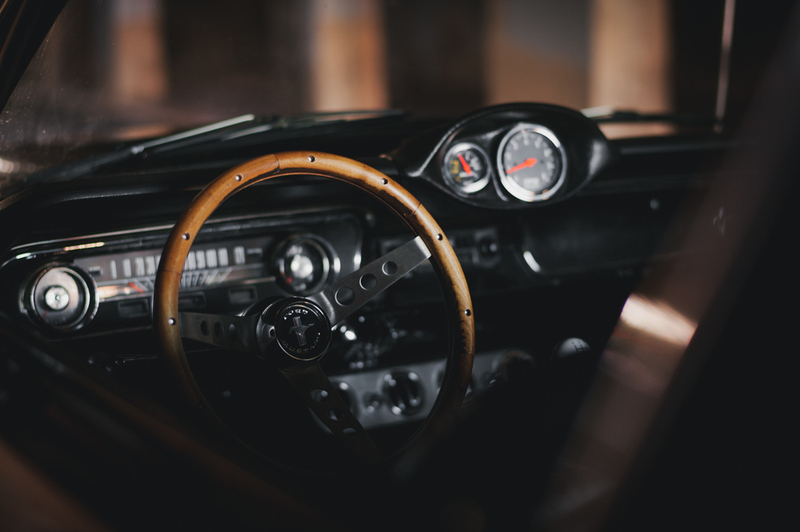 Justin replaced a worn-out Grant steering wheel and added an aftermarket stereo, but otherwise it keeps the mid-century vibes going. I'm immensely thankful to Justin for making the trip over, for choosing me to photograph his car, and for everything he unknowingly did for a dumb 16 year old 15 years ago. Good luck with the move, and enjoy Maryland!